Mule Deer- Wind Cave National Park, South Dakota. 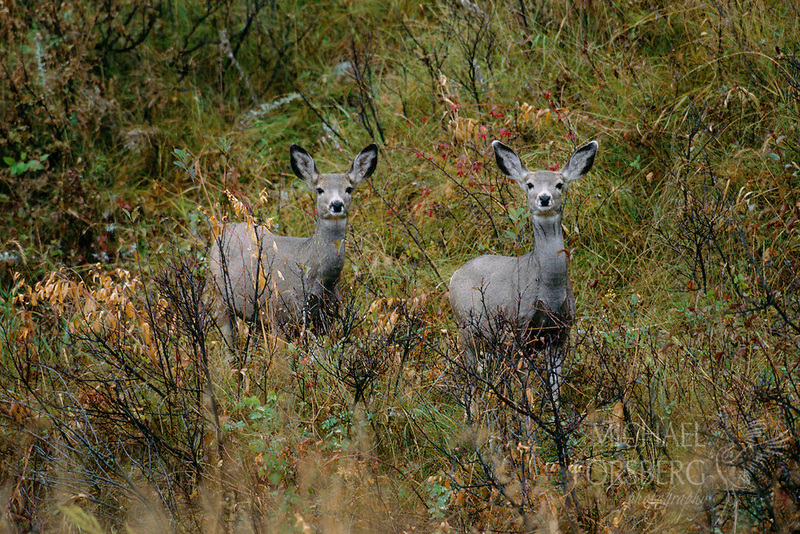 On a misty October morning, a pair of mule deer does pause along a deer trail heading towards a wooded creek bed on the prairie's edge. The mule deer is a deer of open country, found in the western plains and mountain states. Lewis and Clark first described the species for science, and also gave them their common name, Mule Deer, because of its large mule-like ears. First year siblings and most female mule deer, called does, will stick together much of the year, except during breeding season. In the winter, they will be joined by others forming large deer herds during the cold, often lean months.